Doctors at Queenskraute Hospital are warning parents of a dangerous new fad that's sweeping school yards across the country. "Children are snorting crushed up rockets as if the colourful concoctions were cocaine," says Doctor Lisa Cohn. "There have been cases of children snorting candy for decades, but they were rare until recently. Thanks to social networking and youtube videos of children engaging in the act, its popularity has exploded." 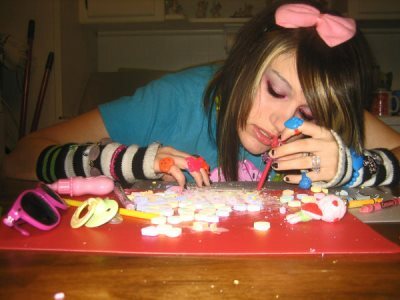 Every day, dozens of children are rushed to the hospital for candy snorting related injuries. "The candy doesn't have any psychoactive properties itself, however the crushed pieces are sharp enough to cut the insides of the nasal region, trapping fragments of sugar into the wounds," says Lisa. "The sugar then ferments, creating a perfect nesting ground for insects to lay their eggs. And that's how children get high from this -- through nasal maggots"
Doctors say that several children have already died from nasal infections as a result of snorting crushed candy. "The maggots who live off the fermenting sugar excrete a variety of byproducts. Some of these are cannabinoid in nature, which produce euphoric effects. Other byproducts are cytotoxic, and can pose serious threat to life and limb if you don't stop the infection in time," says Lisa. "There's no safe way of snorting candy. While the risk of dying from the act is slim, it's just not worth the risk. Parents need to let their children know that rockets are for eating, not sniffing."